12" x 6 1/2" x 6 1/2"
9 1/2" x 6 1/2" x 6 1/2"
6 1/2" x 6 1/2" x 6 2/5"
For the project space Richard Bottwin has created a new group of sculptures he calls "Blue Cubes". 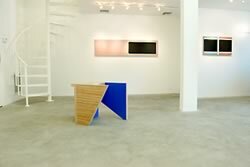 Though Bottwin works in three dimensions, here limited to a plane parallel to the wall flanked by two jutting perpidiculars, his sculptures also show distinct painterly tendencies, such as a keen interest in finish and color. 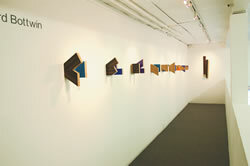 Wall mounted, his works extend, invert, and play a variety of perceptual games, maintaining sculptural integrity in their active engagement with the surrounding space. 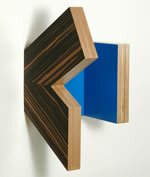 Bottwin's "cubes" are made of thick plywood wrapped and banded with polished veneers guarding interior surfaces smoothly coated with intense and variable shades of blue. Approached from the side overlapping planes shift in their alignments opening in real time to expose the color which is at their core. The assymetrical "arms" address one another in various intricately faceted postures inviting different readings, "seeming to flatten, fold, and move as the viewer moves past". 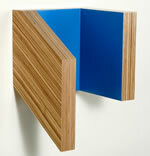 Vaguely anthropomorphic as an open cabinet can be, these small yet complexly constucted pieces resonate with personality while brandishing the rigor of purist abstraction. Richard Bottwin has exhibited widely in the United States and in Switzerland. His work has been written about in the New York Times, the Newark Star Ledger, the Philadelphia Inquirer, and elsewhere. He has twice been awarded grants from both the Pennsylvania Council on the Arts, and the New York State Council on the Arts.